If above Jalebi video does not play, click here. Everyday in Delhi, I ate Jalebi from a roadside stall close to where I was staying. Jalebi is a thin pretzel shaped pastry made from leavened fried dough dipped in sugar syrup. Similar are dessert are also found in Morocco, Algeria, Tunisia and Libya and is known as Zlabia. 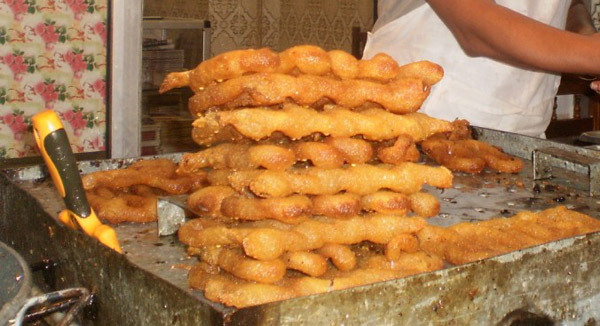 The Jalebi stand was setup in front of a local mithaiwala’s (pastry chef) dessert store selling hundreds of Indian desserts – most shinny silver wrap and all made from flour, butter, milk, sugar, and pinch of spices. The video clip shows making of Delhi Jalebi. Jalebi is an evening time snack in Delhi, India. In Kathmandu Nepal, where it is known as Jeri, it is considered a breakfast food often served with a thin deep fried flatbread called swari. Both go well so together that people normally get them together and referred to the dish as Jeri Swari. 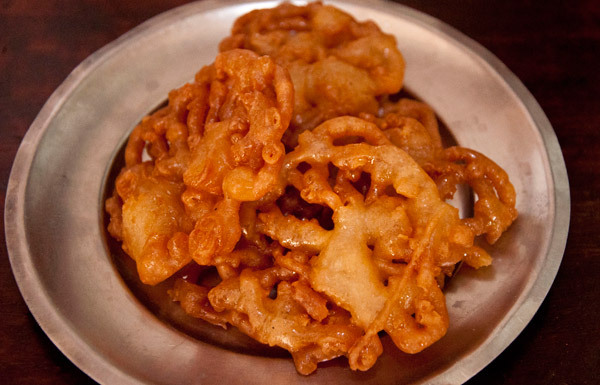 Most of Kathmandu roadside Jeri (Jalebi) stalls serve a simple Jeri. While in India, there is tendency of serving spiced up Jeri. Often one can even find a pretty good quality Indian dessert in the United States – thanks to huge exodus of talented Indian pastry chefs. However, I have yet to find even edible Jalebi in the United States. There is a simple reason behind it – Jalebi is not served fresh in the United States. Jalebi is a fresh dessert – fry batter, soak in sugar syrup and bite into crispy warm dessert – all done within a few minutes. 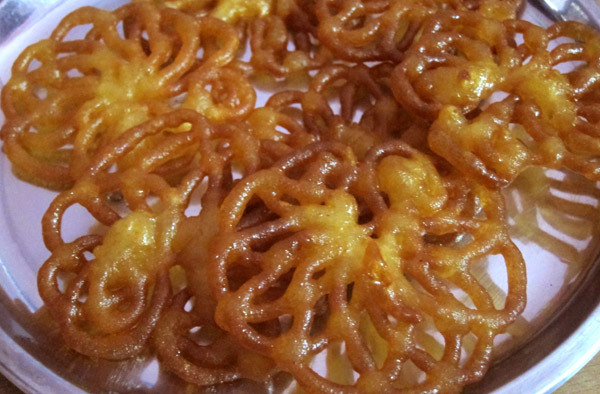 Often many mithaiwalas (pastry chefs) prefer serving cold Jalebi made in a big batch since it is cheaper to make. They try to beat the flavors of fresh Jalebi by adding other flavors such as saffron, cardamom or adding bright food coloring. 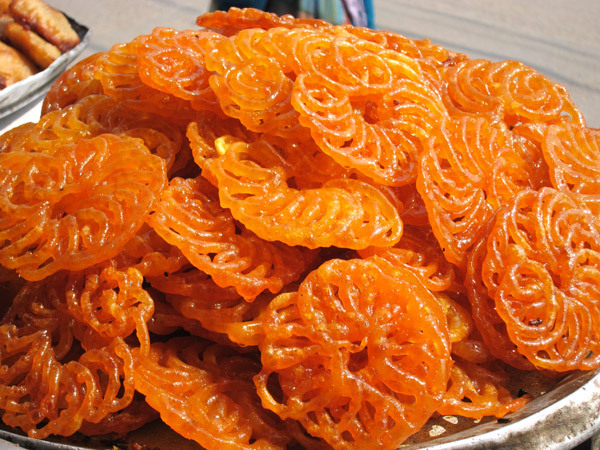 Here’s the news for them – a simple Jalebi fresh off the fryer beats any of stale concoction any day. The small Jalebi stall in a regular neighborhood of Delhi served the best Jalebi I ever ate in my life. The stall was not in a famous tourist or commercial district or had decades of history behind it. They simply made fresh Jalebi. The flour batter for Jalebi was fermented few hours before in morning. Jalebis were fried to order. The batter was put in cheesecloth and dispensed through a small hole to make a desired shapes (see video). After fried golden brown, it was dipped in sugar syrup for few seconds and put in colander to remove excess syrup. The resulting Jalebi was thin crusted goodness – such a simple thing in life can bring such a big joy. After nearly two weeks of eating Jalebi everyday, the Jalebiwala (Jalebi maker) gave me his recipe for what I consider the best Jalebi in world. Many us will disagree on where is the best Jalebi in the world. However, those who disagree also have a easy consensus that a good Jalebi or Jeri or Zlabia is always fresh and often simple. Here’s the simple recipe for Jalebi from the Delhi Jalebiwala. Let it stay for at least ½ hour to few hours. To see more photos including photos of the same Delhi Jalebi with the flash, go to DesiGrub’s Facebook Page. Mouthwatering photos. My favorite dessert too, and I know so hard to get good ones in the US. One foodie described it as “biting into a honeycomb”–good no?! Mouthwatering photos! One foodie described eating jalebi as “biting into a honeycomb” — pretty good description. I wish we got good jalebis here in the US. My favorite jalebi story from India is that there is an invisible “Jalebi Line” that runs across the width of India. Above it is where the really good jalebis come from, and below it, the language scripts *look* like jalebis. @Nan, I love the phrase “Biting Into A Honeycomb” to describe eating Jalebi. LOVE this post, and LOVE this mithai. The video was an excellent visual for the post! Keep rockin’ Bindesh!